The Andean cat is about the size of a large house cat. Its head and body length is 58 - 85 cm (23 - 33"). A male weighed 4.0 kg (9 lb), and a female weighed 4.5 kg (10 lb). Its fur is long, soft and thick. It is mainly ash grey with brown-yellowish blotches that are distributed as vertical lines on both sides of the body, giving the appearance of continuous stripes. The Andean cat's nose is black, and its belly is pale with dark spots. Its tail is very long and is probably an aid to balance when the cat is chasing chinchillas and mountain viscachas as they leap around the rocky habitat. The tail is fluffy and cylindrical, with 6 - 9 wide rings of dark brown to black color. The legs also have dark and narrower blotches or stripes, but they do not form complete rings. The Andean cat is highly specialized in its habitat requirements, usually being found at high elevations (3500 - 4800 m (11,500 - 15,700‘)) in the dry, rocky regions of the high Andes above the timberline. Vegetation consists mainly of scattered dwarf shrubs and clumps of bunchgrass. The presence of rock piles and boulders may be important for the Andean cat. The presence of free water is probably also important, as is the presence of mountain viscachas. The Andean cat’s main prey likely is the mountain viscacha. The mountain chinchilla was probably also an important prey species until its populations were decimated as a result of the international fur trade. Reported sightings and radio-tracking data have indicated that the cat may be active at various times during the day and night. The Andean cat occurs in southern Peru, the highlands of Bolivia, northern Chile, and northwestern Argentina. It is distributed over 620,000 sq km (240,000 sq mi) in these four countries, but intensive field surveys in all 4 countries have led biologists to believe that the Andean cat’s distribution is likely highly fragmented and that this cat is very rare. There are very few records concerning its past distribution and the areas where it was previously recorded generally coincide with those where the presence of the species has been recently verified. The principal threats that the Andean cat faces are: reduction of populations of its principal prey species, hunting and persecution by humans, and habitat degradation. *** Etymology of the scientific name of the Andean cat: the genus name ("Oreailurus") - comes from the Greek ‘oreos’ for 'mountain' and ‘ailurus’ for 'cat'; the species name ("jacobita") - in honor of Jacobita Mantegazza (Yensen & Seymour 2000). 2005: Occurs in Argentina, Bolivia, Chile, and Peru (IUCN 2005). The Andean cat’s total effective population size is estimated at below 2,500 mature breeding individuals (IUCN 2005) . 1) Loss of Prey - This can be attributed to several factors, including: a) hunting of prey by people of the region - principally hunting of mountain viscachas for meat, which is consumed at the local level, or for the skin, which is sold; b) competition between mountain viscachas and domestic animals whose grazing areas overlap with feeding areas of mountain viscachas; and c) competition between mountain viscachas and exotic species - especially the European hare, which was initially introduced in Argentina and is currently found throughout the four countries where the Andean cat occurs. (Villalba et al. 2004) In addition, it is likely that the mountain chinchilla previously constituted important prey for the Andean cat, but the chinchilla was hunted nearly to extinction to supply the fur trade (IUCN 2005) . The head and body length of the Andean cat is 58 - 85 cm (23 - 33") (n = 5) (Yensen & Seymour 2000) . A male from Peru weighed 4.0 kg (8.8 lb) (Yensen & Seymour 2000) , and a female from Bolivia weighed 4.5 kg (9.9 lb) (Villalba et al. 2004) . In Peru, a male was trapped at 4,725 m (15,500') among rock outcrops with bare ground, scattered grass and bushes. In Argentina, an individual was observed at 4,250 m (13,900') in an area dominated by grasses and small shrubs, with wet and grassy meadows, and a small lake. Two specimens from 4,550 and 4,700 m (14,900 - 15,400') in Bolivia were from an open shrubland on rocky slopes, with wet meadows along arroyos, and open grassland. 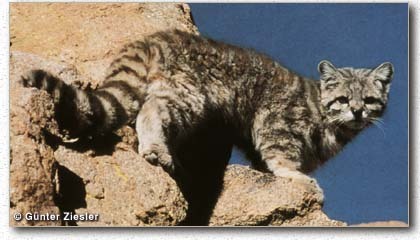 The Andean cat is found in the Chilean Winter Rainfall - Valdivian Forests and Tropical Andes Biodiversity Hotspots (Cons. Intl. 2005). The average size of Andean cat litters is not known, but on two occasions at different locations, 2 cubs have been observed (Villalba et al. 2004) . The Andean cat’s main prey likely is the mountain viscacha. It is also probable that mountain chinchillas previously were important prey of the Andean cat before their populations were drastically reduced due to hunting for the fur trade (Villalba et al. 2004) . The Andean cat's diet may include other species, such as birds and other small rodents, but there is no information on this as of yet (Arkive 2005) . Denning - The Andean cat may den in small caves (Villalba 2002) . The Andean cat is perhaps a solitary species, but adults may be seen in pairs or with cubs during mating season and after births, respectively (Villalba et al. 2004) .